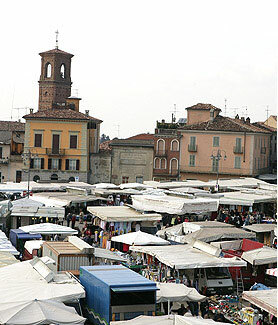 Moncalvo, with little more than 3,500 inhabitants, can boast the title of City (the smallest in Italy) given by the Savoia at the beginning of the eighteenth century and confirmed in 1774. It is located at the boundary between Asti and Alessandria provinces; it is a hillside touristic resort since the nineteenth century, renowned for its “bollito misto”, prepared with the famous tasty piemontese beef. It is also one of the main centres for the precious fragrant white truffle (tuber magnatum pico): the last two Sundays in October are devoted to one of the largest and best known White Truffles Regional Fair.